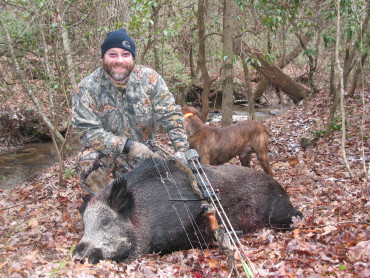 The hunter’s most popular hunting destination for wild Boar hunting and feral Hog hunts. 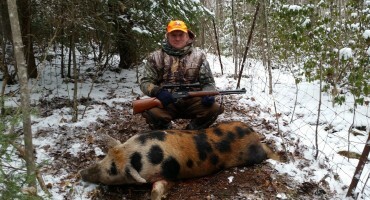 We have specialized in wild boar hunting services since 2001. 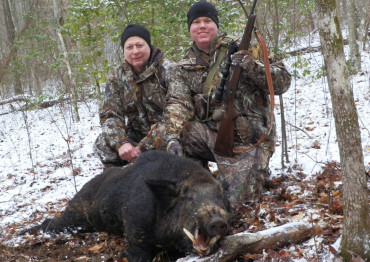 The Russian wild Boar hunting trips is our most adrenaline-filled hunts. Our boar population naturally reproduce in the wild country of our preserve. You will have the satisfaction and challenge of a Free Range, Fair Chase hunt! We also offer hunts for trophy fallow deer, boasting a variety of beautiful coloration. This hunt is a no-miss for those wanting a mix of excellent table fare and a beautiful mount for the wall. Trophy ram and goat hunting are among the favorites for hunters who are beginners, or those who want to get the unique trophy of Tennessee exotics. Fair chase hunts for trophy wild boar and feral hog hunting in the scenic beauty of the Tennessee Mountains. 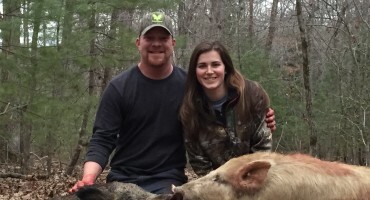 We offer year-round boar hunts backed by a trophy guaranteed policy. We have a better than 90% success rate! 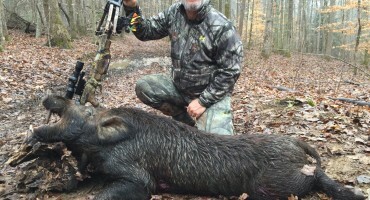 Join us for an exciting trophy wild boar hunt in the scenic beauty of the Tennessee Mountains. We offer year round hunting and our hunts are backed by a guaranteed hunt policy. We have a better than 90% success rate. Hunt some gorgeous landscape, hosting a variety of exotic species. We hunt trophy exotic ram, goat and bison the year around. We hunt fallow deer, trophy bucks and does from fall through early spring. You will truly enjoy the excitement of spotting and (or) bagging one of these unique animals in a beautiful, serene setting. Two words describe this hunt, frontier and food. This hunt dating back to the frontier days, makes for an adventure like no other. Using your skill to take down one of these large animals, will not only give you great satisfaction but lots of lean, healthy meat for the freezer. The main lodge speaks of character, comfort and convenience. 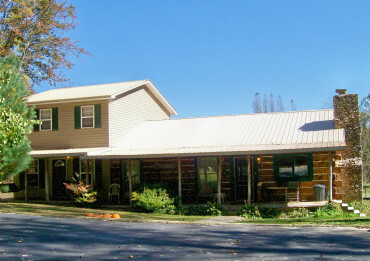 This large 5 bedroom, 2 bath cabin has a fully-equipped kitchen with microwave and coffee maker. It also has central heat and air plus satellite TV. There is a gathering area by the fireplace and in the living area to share your hunting tales while you relax. 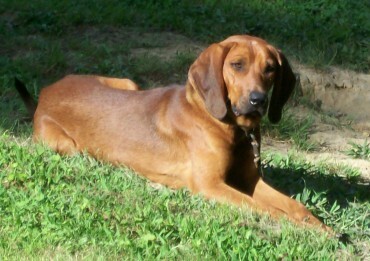 If you elect to do some wild boar hunting with dogs, then you will meet some of our trusted hounds or plots. They are always excited to hit the woods wide open on a hunt. Their sheer determination to bay up some hogs is quite impressive. 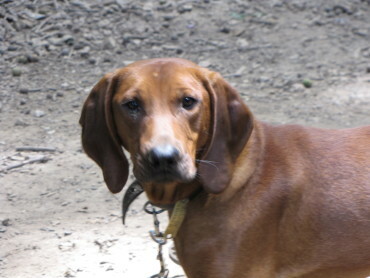 When they sound off with their coarse bark and their keen sniffers at work, hot on the trail, the excitement begins. 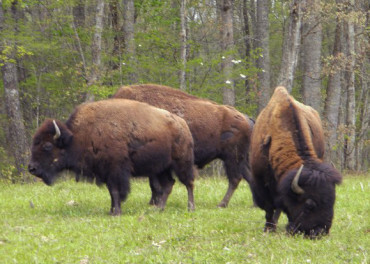 Bison, ram, goat and fallow deer graze the grassland and browse the wooded areas of the property. Trophy ram and goat are among the favorites for beginning hunters or those who want something unique for the wall. 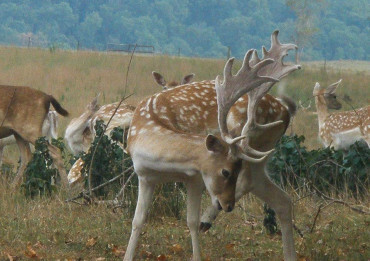 We offer hunts for trophy fallow deer, boasting a variety of beautiful coloration. An exceptionally high percentage of return hunters speaks for itself. We have many repeat customers who either come back every year or want to return at some point. Our customer reviews are very positive. No matter what you are hunting for, we want you to have a great hunting experience and bag a nice animal. We have a guaranteed hunt policy, giving you the assurance that we will do our best to see you have a successful hunt, or you don‘t pay anything other than the minimum booking deposit. Our main lodge and bunkhouse are perfect for a hunting getaway. We want our customers to be comfortable in a clean facility with modern conveniences. Our facilities have fully-equipped kitchens with heat and air conditioning, also satellite TV. We are always glad to help you plan your trip and once you get here, we are on call to assist you if you have any questions. Our friendly, experienced guides will work hard to insure that you have an enjoyable and successful hunt. Killed a great boar of a lifetime. We also got a nice Corsican ram with a bow. Our guide, Tommy was a great guy, very polite and energetic. We hunted hard and came out successful. The owner, Rick even came to help get out the ram. We appreciate everything and will be back next year. Had a wonderful time at Loshbough. Lodging was comfortable and very home-like. We love the mounts on the walls. Guide was very knowledgeable an friendly. Very pleased with my Black Hawaiian ram. He is beautiful and I can't wait to get him mounted. Thank you for a wonderful time and hunt!